This homemade cabbage hot dish casserole is such a comfort food. Loaded with kielbasa and topped with gooey melted cheese, you will think you died and went to cabbage heaven. So easy to make too. It's the last recipe on this page. Speaking of recipes for cabbage, I just had to slip this recipe in. I LOVE this, and you will to (feel free to add more bacon if you want). 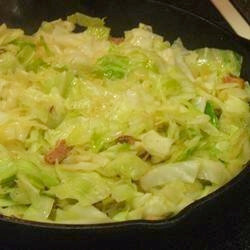 In a large skillet, saute the bacon and cabbage together until the bacon is browned and the cabbage leaves are starting to get tender; approximately 10 minutes. Add the onion and saute until it is translucent. Add the remaining ingredients and cook covered for approximately 10-15 minutes. Splash with the vinegar before serving. Cook noodles according to package directions until tender, but firm - drain and set aside. Meanwhile, in a large skillet, melt butter and add chopped cabbage and onion. Season with salt and pepper. Saute cabbage and onion until it is cooked and beginning to turn brown. Add the drained noodles and bacon; cooking until noodles begin to turn brown. Serve. PREHEAT oven to 350 degrees. Lightly spray a 9x13 inch pan with vegetable oil; set aside. Core and thinly slice the cabbage. Melt the butter in a large skillet with the garlic and onion powder. When it begins to bubble, add the cabbage. Season with kosher salt and freshly ground black pepper. Stir occasionally and cook for 25 minutes or until it starts to caramelize. Meanwhile, cook 1 cup white rice according to directions. Add butter to a skillet and fry the kielbasa until cooked. Cooked rice on the bottom, then the fried cabbage, followed by the kielbasa slices. Sprinkle with mozzarella cheese and bake until cheese starts to brown. I like this with fluffy, buttery mashed potatoes (but I like anything with mashed potatoes).